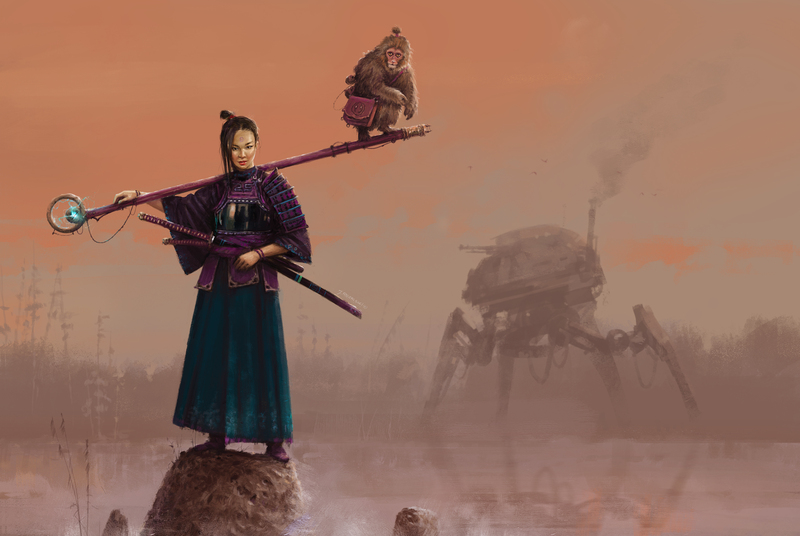 Each player in Scythe controls a character from one of five factions seeking to secure control of the their territory and gain control of the unclaimed lands surrounding the Factory. Anna & Wojtek (Polania Republic [white/red]): Anna was born into a long line of intellectuals and diplomats. After her parents died in the war, she moved in with her grandfather, a former soldier and avid hunter. He raised her and taught her how to shoot a gun. Over time, Anna became an expert marksman. 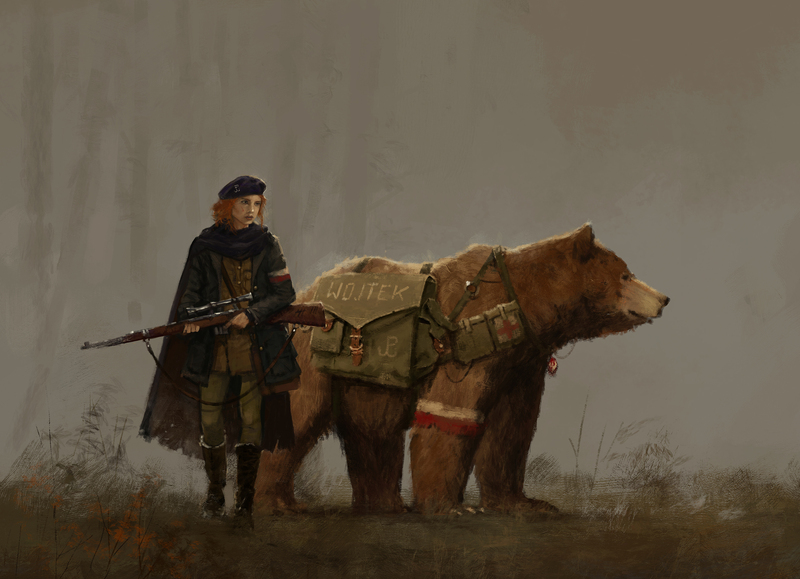 When the Factory shut down and rumors swirling about a growing Rusviet force, Anna and Wojtek accepted a mission to ensure the unity and independence of Polania by securing the eastern border and patroling the lands around the Factory. Gunter von Duisburg with Nacht & Tag (Saxony Empire [black/gold]): Gunter grew up in a wealthy, aristocratic family known for the dire wolves they bred and sold across the country. As a young boy he traveled with his father across Africa, where he developed excellent hunting skills and an interest in archeology. Zehra & Kar (Crimean Khanate [yellow/green]): Princess Zehra was the firstborn daughter of the Khan of the Crimean Tatars. Despite her royal upbringing and against the will of her father, Zehra preferred to practice bow shooting and horseback riding rather than meekly drink tea with dignitaries. She found that she was able to see things before they happened, a skill that greatly aided her archery skills, especially for moving targets. Bjorn & Mox (Nordic Kingdom [blue/white]): Bjorn, the descendant of a renowned Viking family, grew up in a small village in the north of the Nordic Kingdom. For centuries his tribe had bred and raised the massive musk ox seen on many farms across the arctic. From an early age, Bjorn found that he was able to tame and communicate with the huge animals. Olga Romanova & Changa (Rusviet Union [red/gray]): Olga comes from an old aristocratic family that lost their money and position a long time ago. So she was raised on humble means and in harsh climates, surrounded by simple people and nature. 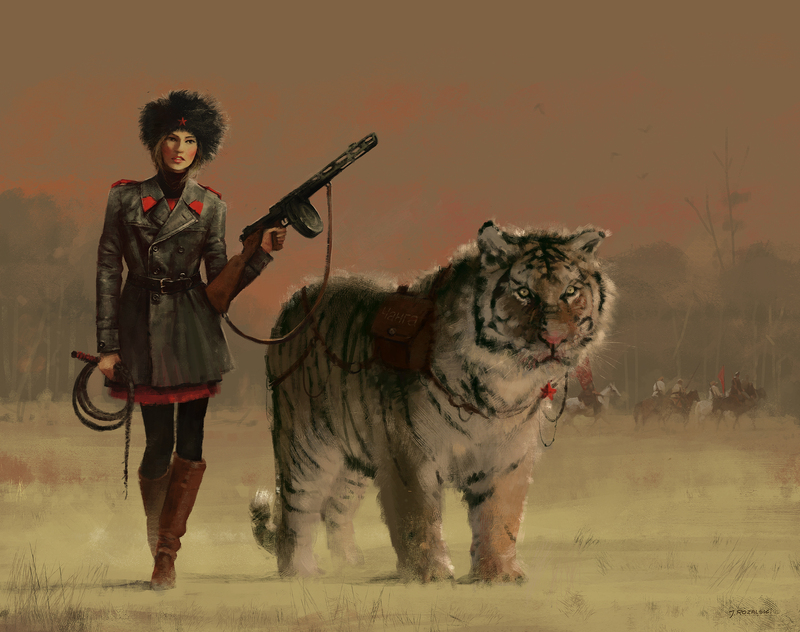 From childhood Olga was taught to have great respect for the Siberian tigers that prowled the Rusviet tundra. Unfortunately, the great war began, and Viktor was called away to service. They continued to write, but one day Olga received word that Viktor had gone missing in enemy territory. 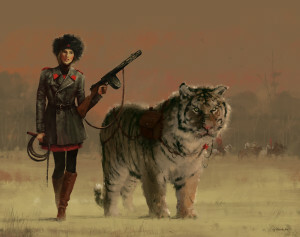 She vowed to find him, so she joined the Rusviet military intelligence service with Changa at her side. With her intelligence and ambition, she quickly climbed the ranks, and she finally got the chance to search the western lands for her beloved Viktor with the full strength of the Rusviet military at her back. Connor & Max (Clan Albion [green/gold]): Connor is a highlander, a native of the southern area of the island controlled by Clan Albion. He comes from a long line of military legends, a tradition he perpetuated by entrenching himself far behind enemy lines during the Great War. 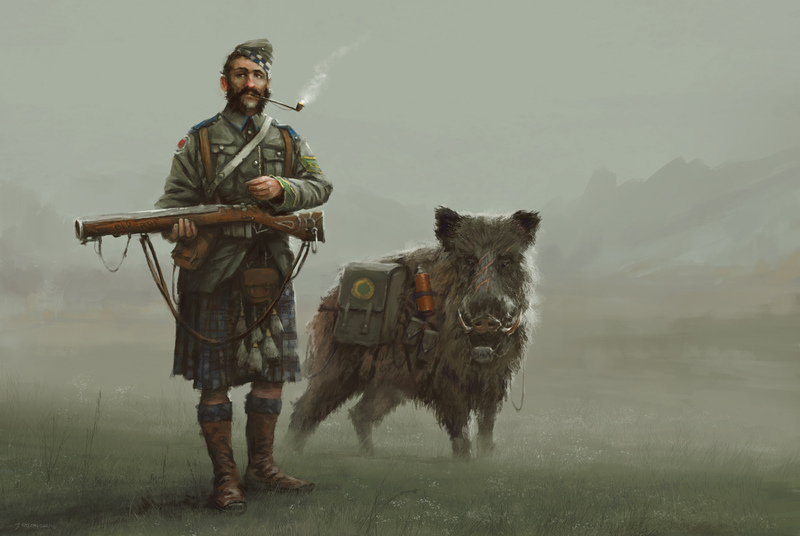 He owes his life to his faithful companion, a wild boar named Max, who saved him from a pack of dire wolves in the foothills of Saxony. Akiko & Jiro (Togawa Shogunate [purple/white]): From an early age, Akiko, the niece of the shogun, read stories of warriors and adventurers in faraway lands. She was especially fascinated by the beauty and art of sword fighting. When she turned 16, Akiko begged her uncle to let her train at the most elite samurai war academy, and he agreed. She was a model student, practicing constantly until she excelled at fighting, shooting, strategy, and tactics. Bursting with pride, the shogun gave Akiko a special trained monkey named Jiro. 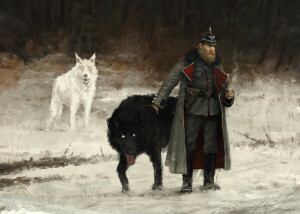 These characters and illustrations were created by Jakub Rozalski. These miniatures look gorgeous. What scale are they? Also, is the plan to now have mostly miniatures for pieces as opposed to mostly card board pieces for at least one version of the game? As a Euphoria backer I can attest to the higher quality components making a difference. I’ll back either way, but would be happy to pay more for more minis. The figurines are 28mm tall, with a few more millimeters for the base. Yes, the original plan of using cardboard standees is completely gone. The characters and mechs are now plastic miniatures and the other tokens in the game (resources, structures, workers, tech tokens, etc) are wood. @Jamey – Great to read. In addition to Scythe likely being an incredible and beautiful game, having the minis at that scale might allow us to mix them into other miniature games like Dust. If I wasn’t on my cell phone I would insert the obligatory Futurama “take my money now” meme. Thank you for the response and please keep up the good work. Have you considered the possibility of working with a indie studio and developing this into a PC RTS? I think there would be a great demand for it, the RTS genre has become very stale recently. Great work, and whenever your kick starter launches I will be the first to help you guys out. Very hyped. If he leads the saxony empire, it would make sense to name him after a city or dukedom in the eastern regions, (e.g. hartenstein in sachsen (hardstone) or blankenburg in sachsen-anhalt (freecastle) would me historically appropriate (pre18.th century) and namewise intersting – please not duisburg- which is totally close to the dutch/ oranien nassau boarder of the germanian regions in the west. Stylewise he also represents a prussian infanterist which would support the regional emphasis of brandenburg – sachsen. As a German lover of your games i would really appreciate your consideration. Hi Sascha, thanks for your input. Jakub has done a lot of research to create these characters, though we’ve adapted them for this alternate reality (it’s not real-life Europe, so true historical accuracy isn’t necessary). Gunter isn’t the leader of the Saxon faction–he’s merely a character who is sent on a quest by the Saxon king. As a German speaker, I mostly think the design decisions for the saxon faction were fine but also found decision for the name “Duisburg” odd. WOW these look amazing! I am loving the world you seem to have created here. I really hope that other characters, from different nations, become available. These look (and read, and feel) fantastic. I wonder about the name “Tag” for the wolf. You seem to be suggesting daytime, but I think the word “tag” in German may mean a period of 24 hours, rather than the time that the sun is visible in the sky. I don’t speak German, though, so I may be wrong. And it may not matter; I got the point. Just a thought. Jamey + Jakub are correct: “Tag” in German is perfectly fine for saying “daytime”. Yes, it’s also the unit: 1 Tag = 1 day = 24h. But “am Tag” means “on the day” or better “at daytime”. The thing that makes me, as a native German speaker, cringe a little is the order: “Nacht & Tag” is pretty uncommon and sounds odd to us compared to “Tag & Nacht”. -> One sounds much more familiar than the other. Compare “heaven and hell” to “hell and heaven” which have a similar odd ratio in English. Ha! *Familiar…not sure if you caught your own pun (An attendant spirit, often in animal form). It looks great… but will there be a green player? One of the expansion factions (Celtic-inspired) is green. Thanks Kara, I’m happy to hear that! It’s been a pleasure to work with Jakub. Jamey, I’be been making my way through the numerous interviews, podcasts, and articles. These heroes and heroines are all beautifully rendered in pictures, along with their well written histories. It’s a first class looking game and I commend you for the energy you’be put into this project. Joe: Thanks for checking out the various pieces of Scythe-related media! I’m glad you like the characters and the backstories Jakub created for them. It’s actually that it’s common for a game to have one or two battles *per player. * Kemet influenced it in terms of how you have control over what you input into each combat and that losing combat is only a minor setback. Oh I see, plus the card to use combat strength too right? Right, that’s part of what you input into combat. Beautiful looking game, August 2016 is too far away! Really interested in this game! How about a Dutch faction? I find it interesting that the farming aspect is very important. My name “van der Ploeg” means of the plough. How about a farmer turned hero for a Dutch faction? What about a Latin-culture based faction? I think is a better solution than an Italian, French or other specific South Europe country, much like the Nordic faction is a “cultural union”. Perhpaps trade skilled, like a Merchant Republic. Just don’t know how the name of the government coul be, as all the seven factions have different forms and names of State. The Tabletop Simulator version of Scythe is fantastic. I would like to point out though, that the automa reference cards are misprinted for Automa Move Character. It doesn’t match the text for your automa rule book. Actually, I just looked and it’s the icon for the card that may be wrong. Hi Paul, thanks for letting me know. I’ll tell TS about it! Actually, I think the problem isn’t with Tabletop Simulator (TS) it’s with the icon art on that card. If you used the same art on the physical version, it could be confusing but nothing a FAQ couldn’t fix. I almost ONLY play Scythe now on Tabletop Simulator! Fantastic solo variant. I have created a group in Steam for Scythe players to find each other and play. This game is really good. Love the art of the characters! I just wish I loved their back stories as much. Unfortunately, I am having a hard time connecting to what seem to me as one-dimensional characters. Take Bjorn for example, besides “a yearning to see the world beyond his tiny village,” we don’t know anything about his personality or motivations. Or Olga, who I could see having a sinister, power-hungry side (perhaps stereo-typically from her whip and posture), but is consigned to bland, generic adjectives like “intelligent” and “ambitious,” and an even blander romantic motivator. The art has a lot more flavor than the stories! I assume that Wojtek is named after the Polish II Corp bear. Do any of the other characters/animals have a similar historical precedent? Jamey, Is there a way you can provide larger, higher quality images. I am working on painting my figures and that would really help. The ones above blur at higher image size. If they are already out here somewhere could you guide me to the right location? The best place to see the images, though, is the art book, which is only available in hardcover. This world is large and very captivating to think about. I really wish there were more alternative eastern factions in it like Austro-Hungary; Romania; Finland, maybe even Turkey or balkan nations. I even have ideas for the names: Habsburgyar Empire (or Habsburgo-Magyar Empire); Rumanian Principality; Finnobaltic Commonwealth; Balkanic Federation and Turk Sultanate. I really hope to see the incredible alternative univers expand this way or at least to know more about the lore of it. Where is the USA in this alt-timeline? What is that futuristic-looking sci-fi tech we see in the art? What exactly is the factory? Thanks for sharing your opinions and suggestions! 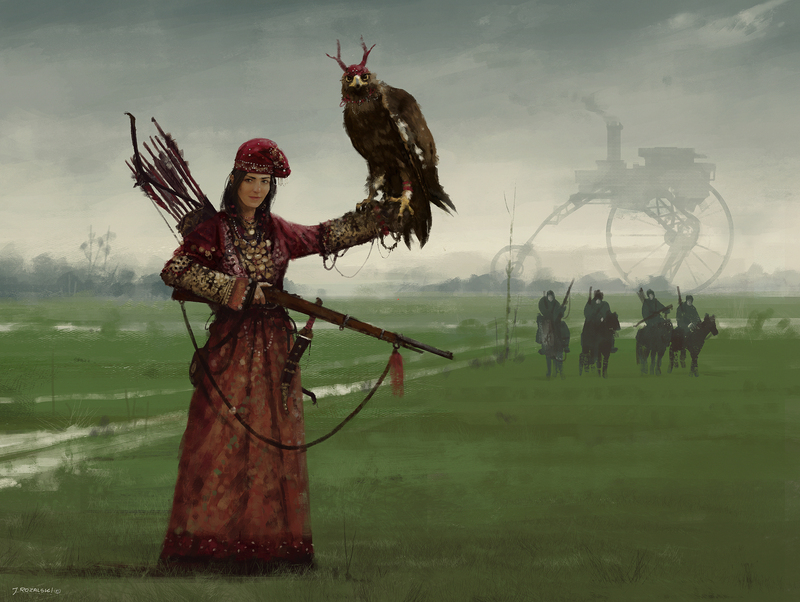 For Scythe, the lore transcends text–it’s built into the art of the game. Feel free to check out the art book so you can see all of the art in the Scythe world. Just to note, I’ve already read comments made regarding the cost of molds and do appreciate the difficulty and marketing of using them. So I understand a simple no, for the sake of marketing. Business first. 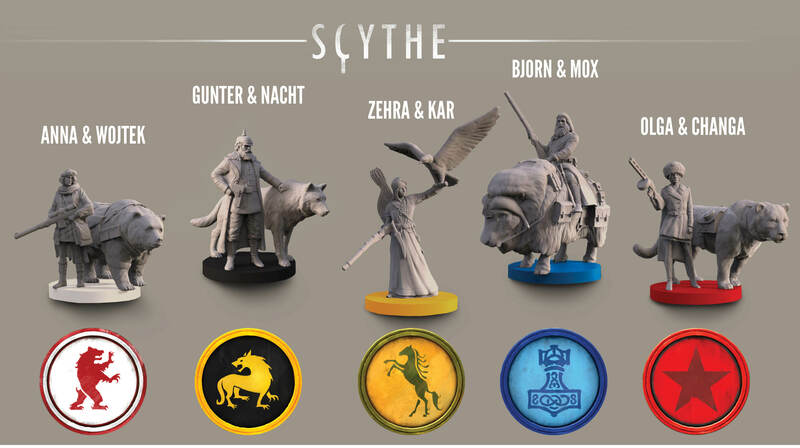 First, myself and a few friends have started putting together an RPG system for the world of Scythe and of course, the board game miniatures will be being used. We can get Husssar minatures elsewhere, however would you consider creating an official Hussar / Soldier type miniature expansion considering how prominent they are in the art? Obviously in reality Giant Mech beats Horse every day of the week, then again in my last game Anna and Wotjek stomped through a fair few through some serious bluffing in combat. Second, as the board can of course be flipped for much larger hexes, would there be any consideration for larger Mech models? Simply to capture their gargantuan size or even just as collectors items outside the game itself, or is Scythe beginning to wrap up? Finally, with Fenris incoming later this year, if the box includes werewolves inspired from Jakub’s art (both silly and incredible if that actually happens) can promises be made for a Gnome expansion? The people have spoken, and the people want Mechs Vs Gnomes. That’s really neat that you and your friends are working on an RPG system for Scythe (or is it more of a tactical combat wargame you’re making? It kind of sounds like that). While we’re not making more miniatures for Scythe, we’re always happy to see fan creations. The Rise of Fenris is the final expansion for Scythe, followed by two accessories (modular board and metal mechs), then we’re done. I’m curious for Jakub to further explore his werewolf and gnome worlds, but they’re each set in their own universes–there is no overlap with Scythe. Hey Matt, are you planning on putting this man-made RPG system on boardgamegeek or somewhere similar? One little thing i noticed. On Gunter’s description, it says the emperor asked “them” to go east. If I was describing me talking to a person and their pets, I wouldn’t say “I asked them”–it seems more proper to say he asked him (Gunter), then maybe mention that he took the dire wolves with them. Love your game :) I am cosplaying as Gunter tomorrow and plan to stay in character during the game. You might want to include the faction symbol or the color of the faction next to each name in the character description. I am new to the game and had to keep scrolling up to the figurines to see what faction color + symbol they belonged to.